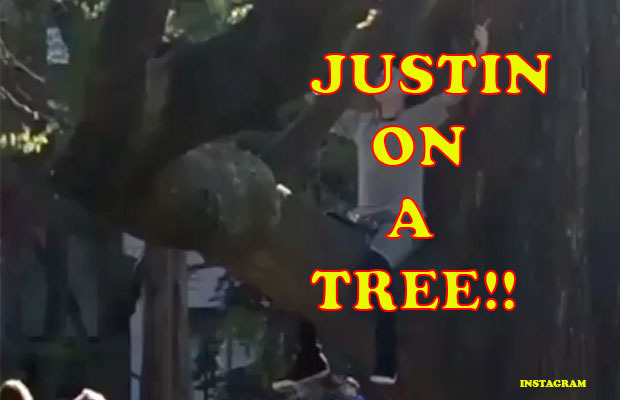 Watch: Justin Bieber Spotted Sitting On A Tree, And Look What He’s Doing! [tps_footer]Hollywood’s biggest and the youngest sweetheart Justin Bieber who has been an undeniable singing sensation and turned out to be a much-loved Baby of the music industry with millions of fans loving him and wishing the best for him always, has done something weird again and he has no time to regret it and don’t expect a Sorry. Justin Bieber was spotted recently at the Boston Public Garden on Wednesday. The ‘Sorry’ singer sat up on a wide branch of a tree in the park. He looked calm and composed, enjoying his music ‘Scarborough Fair’ in the background. He was enjoying some time away from his fans. On Monday, the star had been seen in the same park wandering around barefoot and feeding squirrels. Justin Bieber gets a lot of crazy love from his fans who never miss an opportunity to pose with him no matter where they spot him. Well, we don’t blame Justin‘s super crazy fans for this kind of response although it’s difficult to handle it but one should have an objection when fans are misbehaving and crossing their limits. Otherwise, if you are a celeb what do you expect? People shouldn’t notice you, ask for a pic or autograph, bless you with hugs and kisses. Isn’t is normal for stars to face all of this? And shouldn’t stars be humble enough to be thankful towards their fans who have made them a star from an ordinary performer? We find this kind of attention and love very normal from audiences and die-hard fans towards their favourite stars. But, Justin Bieber has a different take on it, in fact, Justin has openly left messages for everyone to know that he won’t be taking pictures with any of his fans and he is fed up of getting clicked every now and then. Next articleSultan Wrap Up Party: Salman Khan Goes Crazy With Happiness!